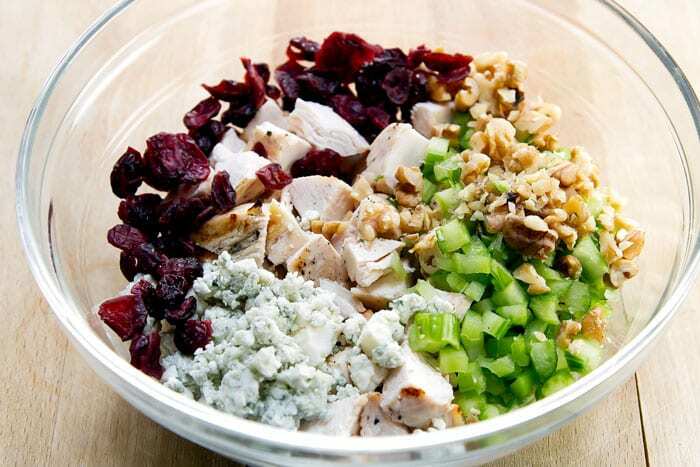 Fresh and flavorful chicken salad lettuce wraps with celery, cranberries, walnuts and a creamy mayo dressing. Confession: Even though I’m a (sometimes) grown-up who doesn’t have children, who is not a student or a teacher or someone who works in education I still love this time of year, also known as back-to-school. I miss my trapper keeper, Esprit tote bag, and Guess jeans. Can anyone relate? So while perusing the grocery store shelves last weekend I think the back-to-school bug bit because I filled my cart with all sorts of stuff for take-to-work lunches. I can’t justify buying school supplies, but the season has spark lunchtime inspiration. Totally makes sense, right? When I paid out the girl who helped us said, “Oh, looks like it’s back-to-school time at your house – you’ve got a lot of stuff for lunches!” Seeing as I don’t have kids I just laughed and then quietly judged myself for buying three cans of Pringles. So in celebration of back-to-school I’m sharing a great take-to-work lunch option: chicken salad lettuce wraps. 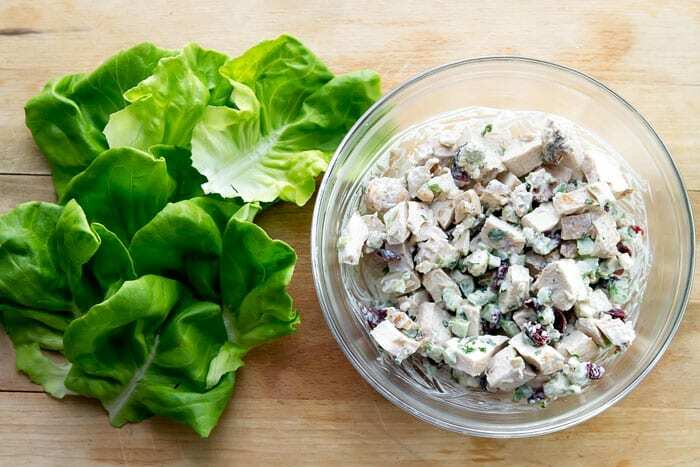 You can make the chicken salad ahead and keep it in the fridge so all you have to do is pack it, along with some butter lettuce, before you leave for the day. All of it is mixed together and piled into lettuce leaves. I like to store the salad seperate from the lettuce leaves for easy take-to-work lunches. Oh, and treat yourself to a brand-new lunchbag to carry it in – the back-to-school spirit isn’t just for kids! 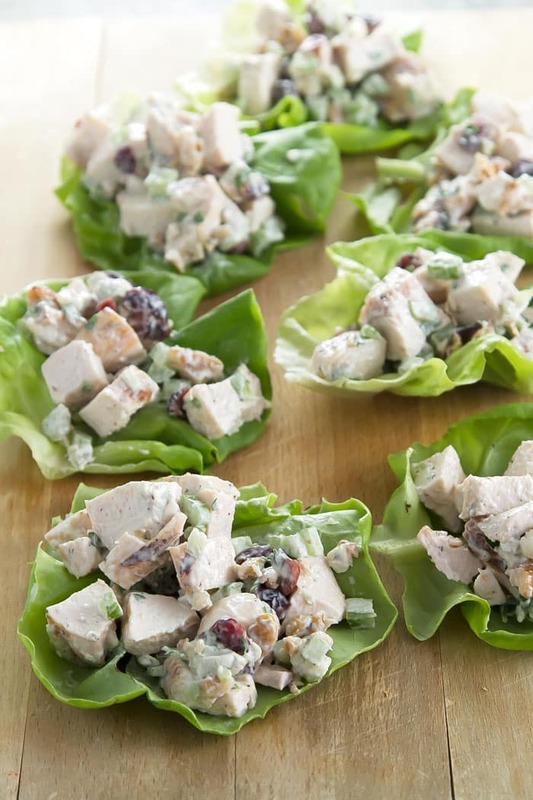 When I use chicken breasts for dinner recipes I always cook a few extra for lunches like these chicken salad lettuce wraps with dried cranberries and blue cheese. Combine all of the ingredients, except the butter lettuce, in a medium-sized bowl and stir until well combined. If making ahead of time, cover the bowl and store in the fridge until ready to serve. 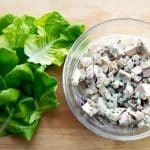 Fill each lettuce leaf with a scoop of chicken salad. If you make this to take to work/school/wherever you’re going be sure to keep the lettuce leaves and salad separate until you’re ready to eat otherwise the lettuce will lose its crispness!